E3 2010 is upon us and while going through my post drafts and decided what to kill and what to save I was a click away from sending this post into oblivion until I decided to revive it and post for the world the see why Nintendo Execs could be using gold bars as coasters and precious stones as offerings to the gaming gods. Making money isn’t a bad thing as that is the aim of every business and lately with the gazillions of Wiis, DSs and first party games from Mario and others that Nintendo has been selling the dollar bills have really stacked up. Doing some rough calculations I believe Nintendo has made probably $800 off me in the last three and a half years but luckily for me (and Nintendo) I don’t regret spending a cent On two different versions of the DS, lots of games for it, plus more games for a Wii my mother won in a competition. 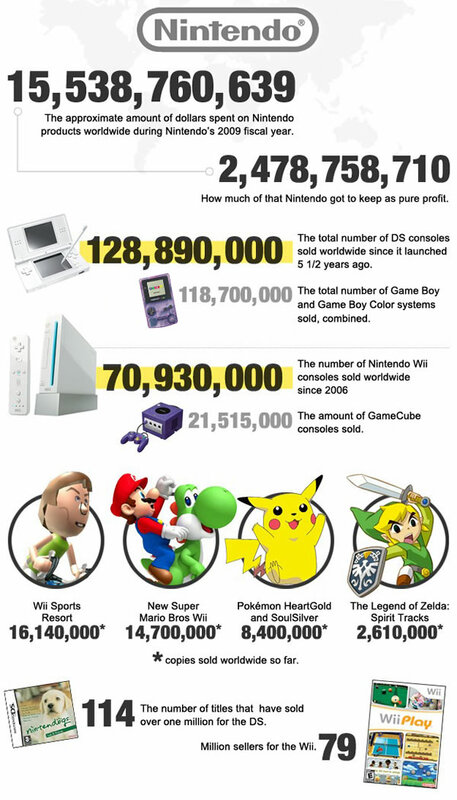 I did blog many years ago that Nintendo had become one of the top ten most valuable Japanese companies, alongside household names such as Toyota, Canon and Honda. So enough of my gibberish feast your eyes on the year old numbers below courtesy of 1Up and look out for my post E3 2010 post on the 10 games that caught my eye. I am interested to see what you think of the 3DS. The game list is super long and I’m already thinking about how broke I will within the next few months. It’s not so glamourous as it sounds. It’s actually just that I attained the Platinum Elite Status for buying too many Nintendo products for the Club Nintendo Year. For attaining that status 2 years in a row, I recently got invited to a Super Mario Galaxy 2 pre-launch party at Nintendo World. It was a nerdy good time. Swag is the best!